All visitors need a visa for India, except citizens of neighboring Nepal and Bhutan. The Indian government has now introduced one-year, multiple-entry electronic visas for citizens of most countries. Otherwise, if you want a longer visa or you're not from one of those countries, your Indian visa must be obtained before arriving in India. Here's what you need to know to prepare your India visa application. Visitors staying in India for less than 72 hours can obtain a Transit visa (a confirmed airline booking for the onward journey must be shown when applying), otherwise an Indian Tourist visa is necessary. The length of the Tourist visa will depend on your nationality. Citizens of the United States, Canada and Japan are given Tourist visas of up to 10 years validity. In addition, five-year Tourist visas are increasingly becoming available for people from most countries, where biometric enrollment facilities are available. Otherwise, Tourist visas are generally issued for three or six months, or one year. The visas are usually multiple entry visas. Do be aware that the visa is valid from the date of issue, NOT the date of arrival in India. In addition, no matter how long your Tourist visa is valid for, you're not permitted to remain in India for more than six months (180 days) at a time. Furthermore, some Tourist visas only allow stays of up to three months at a time. Also note that although a two month gap previously applied between visits to India on Tourist visas, this has been removed for citizens of most countries. 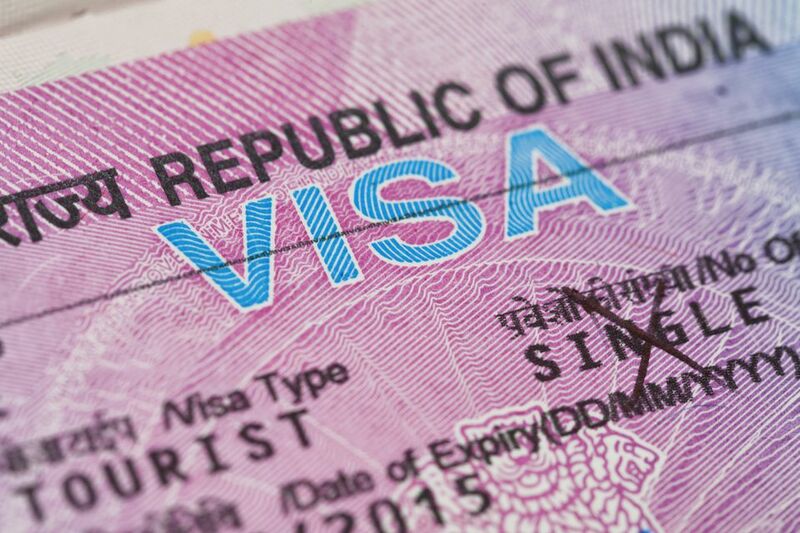 Other types of visas that are available for visitors to India include Business visas, Employment visas, Intern visas, Research visas, Student visas, Journalist visas, and Film visas. How Much Does an Indian Tourist Visa Cost? The cost of an Indian Tourist visa varies between countries, according to the arrangement between governments. The latest rates are effective from July 1, 2018. The fee for US citizens is $160 for five or 10 years. This is excellent value, considering that a one-year E-visa costs $100. Processing is additional and costs $19.90. There are also other incidental costs such as a Biometric Enrollment fee, although these are not significant in amount. Some countries, such as Japan and Mongolia have special agreements with India that allow their citizens to pay significantly less for a visa. Citizens of Afghanistan, Argentina, Bangladesh, Democratic People's Republic of Korea, Jamaica, Maldives, Mauritius, Mongolia, Seychelles (up to three months), South Africa and Uruguay do not have to pay a visa fee. The Indian visa application process is outsourced to private processing agencies in most countries. You will need to submit your application to the relevant agency in your country, NOT to the Indian Embassy or Consulate. In the United States, Indian visa applications are handled by Cox and Kings Global Services. In Australia and the UK, it's VFS Global. In Canada, BLS International handles visa applications. When applying for an Indian Visa, you'll firstly need to complete an on-line application form. See Tips and Instructions for Completing the Indian Visa Application Form. Following this, you'll need to print and manually submit the application form to the processing center, either by mail or in person. Your passport and visa will be returned to you by courier if you elect not to pick it up. Along with your application and fee, for an Indian Tourist visa you'll need to submit your passport that's valid for a least six months and has at least two blank pages, a recent passport-sized photo (check the requirements as it changes, the current requirement is a square photo 2 inch x 2 inch), and details of your itinerary. Copies of flight tickets and proof of residential address may also be required. Your visa application form may have the space for Indian referees, but this section usually isn't necessary to be completed for Tourist visas. How Long Will It Take to Get the Visa? The Tourist visa processing time for US citizens born in the US is generally five to 10 business days. Even if you have a valid Tourist visa, there are some remote areas in India that require foreigners to obtain a Protected Area Permit (PAP) to enter them. These areas are usually near borders, or have other security concerns associated with them. Such areas include Arunachal Pradesh, Andaman and Nicobar Islands, and some parts of northern Himachal Pradesh, Ladakh, Jammu and Kashmir, Sikkim, Rajasthan, and Uttarakhand, In many cases, individual tourists are not allowed, only tour/trekking groups. You can apply for your PAP at the same time as you apply for your Tourist visa. Alternatively, it's also possible to obtain it while in India before going to the protected area.